His remarks came after the opposition launched a united attack on the EC over the use of EVMs. 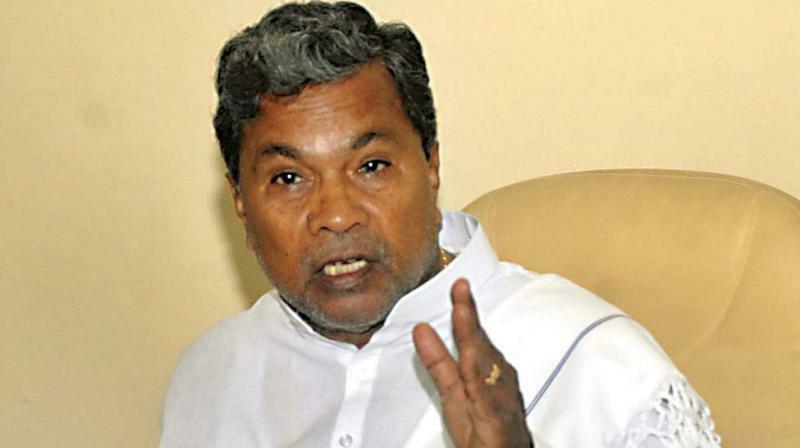 Mysore: Former Karnataka chief minister Siddaramaiah has alleged that the Election Commission(EC) is under "pressure" from the Modi government to not take action on complaints of political parties over alleged EVM tampering and their demand for re-introduction of ballot paper. He said the electronic voting machines (EVMs) are not tamper-proof and Voter Verified Paper Trail (VVPATs) machines are not without their flaws either, he said adding that the Congress will bring back ballot paper if voted to power. Alleging that EVMs were rigged during the 2014 general elections, Siddaramaiah said it could happen this time but "not all EVMs can be tampered with" and therefore, it would be impossible for the BJP to get a majority at national level in the current elections. His remarks came after the opposition launched a united attack on the EC over the use of EVMs and demanded 50 per cent of the machines be verified against VVPAT slips. Andhra Pradesh Chief Minister Chandrababu Naidu complained about EVM malfunction during April 11 polling and demanded re-election on 150 assembly seats. "All political parties met the Election Commission several times and raised concern about EVMs but it did not act on the complaints. I think the EC is under pressure from the Modi government," Siddaramaiah told PTI in an exclusive interview. The Supreme Court's order to verify five EVMs with VVPAT slips is nothing but "patch work" and even the demand to match 50 per cent EVMs with VVPATs will not help, he said, and endorsed that the only solution was to go back to the ballot paper system like other countries, he said. Many countries have gone back to ballot papers as they find it to be a more reliable and secure way of conducting elections. Netherlands, Ireland, Germany and Italy have stopped use of EVMs due to security concerns, he added. Asked if the time has come to re-assess the way EC officials are selected for conducting fair elections, Siddaramaiah said, "For this, the Constitution has to be amended. The Constitution emphasises on conducting 'free and fair' elections and the the EC should fair and unbiased." The Congress leader said that he was not "scared" of rigging of EVMs in the state as he doubted the possibility of hacking all machines. "They cannot tamper all EVMs, it is done selectively. I don't think BJP will get the majority," he said, and added, "People will definitely teach them a lesson." Asked if the Congress will re-introduce ballot papers if it comes to power, he said, "Of course, we will do it 100 per cent. EVMs will go, ballot paper will be introduced." Ballot papers need to be re-introduced as there are continuous challenges to the fairness of the election process that would undermine the trust of the general public as well as the candidates in the EC's impartiality. "I feel we should go back to ballot paper system. All this patch-up work will not work. If it is not happening this time, it should happen at least in future," he said. The ruling party should abide by the provisions of the Constitution and Representation of People's Act. "If it is not abiding with the rule of the law, then it does not have business to continue in the power," he added. Karnataka will vote in the 2nd and 3rd phases of polling on April 18 and April 23 respectively.